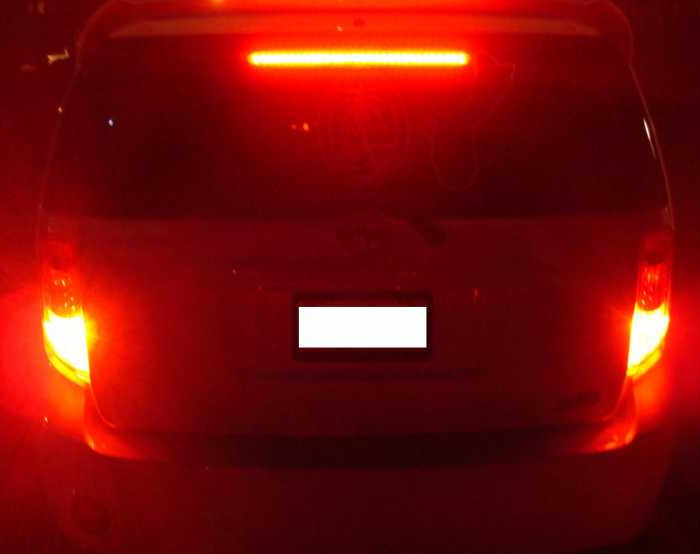 If you have the scenario where you have a single led strip lighting up your parking lights as well as your brake light, you might find that they burn at the same brightness. But you want your parking light to be dimmer than your brake lights, so to fix this problem with your led tail lights, what you could do is use a voltage regulator. Supply the power separately to the brake and parking lights. Lower the voltage to your parking lights to 9 volts. You can still supply the brake lights with the full 12 volts. This setup could work on your led trailer tail lights and also your led motorcycle tail lights. Ok. As most of you know I made my custom led tail lights. I am working on wiring them up right now. But I have run into a problem. The stock set up uses a dual filament bulb. 1 filament for parking lights and 1 filament for brake lights. I made my tail lights so that the red led strips are used for both the parking and the brake lights. My problem is that both the parking lights and the brake lights have the same volt output. So I don’t have a dimmer parking light than I do a brake light. I am assuming I am going to need a resistor to cut down the volts of the parking light so the leds are dimmer than the brake lights. But what size resistor? I know oznium sells that dimmer switch but I don’t want to spend 20 bucks when I could hopefully buy a 1 dollar resistor and have it done. So I reach out to you knowledge of the oz world. After more searching I did find this. I wired them into both the brake and running lights. I used a 1K 1/2w 5%CF resistor on the running light positive lead to dim them. Also put in a IN4001 diode on both the running light and brake light positive lead to eliminate the chance of current flowback. The diode is easy I knew that. But would this resistor he used work then? Last thing I want it to burn up my led strips and be out a ton of money and all this work. Or use a voltage regulator cut voltage down to 9 volts on the parks then supply full 12 for the brakes. I set up my turn signal using a simple resistor and diode. I based it off of a post on here back almost 2 years ago, haha. I’d let radio or vette pop in here and explain. Well I went out and bought the resistors. They def do dim them quite a bit. I am going to have to wait to see how they look at night if they are still very clear and visable. Alright got it all wired up. Looks great. But I am afraid the parking lights might be too dim. I can barely see them in the day time here. We will see how they look at dusk and at dark. But everything else looks great. The brake lights should be plenty bright for day time use as well. Combined with my led strip 3rd brake light as well. If I did want to brighten the parking lights up just a hair what resistors should i move to? What resistor did you get? 220 ohm, 1/4 watt 5% tolerance. It seemed okay for the project I did, but I was using an LED tube with 6 LEDs. That would be brighter than the one I used no? Because I def want to have it a little brighter than what I have now. Even when it is cloudy I couldn’t see then really at all. EDIT: Well after it just got a hair bit darker out. The parking lights aren’t too bad. Still might brighten them up just a bit though. Hrm ok. Maby I will buy them and try them. They are only a buck. And i don’t have one no. I don’t think a half watt is good. It would need to be much bigger wattage to dissipate the power / heat safely. It might work for a bit, but doesn’t seem too reliable. Do explain. The leds in the tails are drawing so little power. My volt meter says the car puts out like 13 volts to the brake wire when on the brakes. So that is normal. What would you reccomend. We use a 1/4w resistor when hooking up to a 20 mA LED. I’m not sure exactly how many mA your LEDs are drawing, maybe 200mA, so I’d think to be safe you’d need a bigger amperage resistor. Waiting for someone with more knowledge to chime in. That was why I had sugested the voltage Regulator earlier, Or spliting up the LED’s and rewiring. Resistors waste energy , cause heat ect. OK. Well I have never toyed with a voltage regulator. Any ones you suggest? Preferrably from radio shack as my car is undrinkable till I get these done lol. Lol. WTF was I drinking when I typed that. Undrivable. Any ideas for the correct volt regulator for this? I’ve been doing research but haven’t found anything solid.